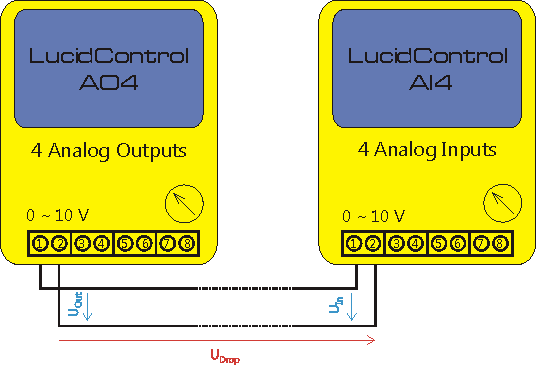 The Analog IO modules of the LucidControl USB IO product series allow to implement 0-10V interfaces and 4-20mA current loops. In the following the differences between these two principles are explained. 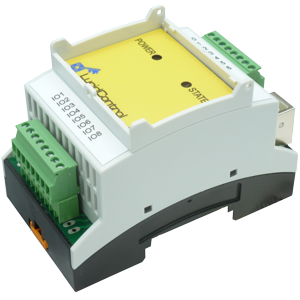 When a voltage is used in order to transmit an analog value, the LucidControl USB Analog Output Module can be employed to generate the analog voltage UOut which can be in a range of 0-10V. 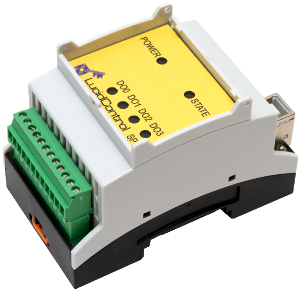 The USB Analog Input Module on the other end of the line measures the voltage UIn which has ideally the same value as the generated analog voltage UOut. In the real world the two analog voltages are different and UIn is slightly lower than UOut. The reason for these losses is a voltage drop UDrop across the transmission line which is caused e.g. by the resistance of the cable. Since the USB Analog Input Module has an finite input resistance a (very low) current flows on the transmission line which results in a voltage UDrop. This voltage drop may be acceptable for short transmission lines since the error caused by this principle is very small. The longer the transmission line gets, the more important is it to avoid this error. 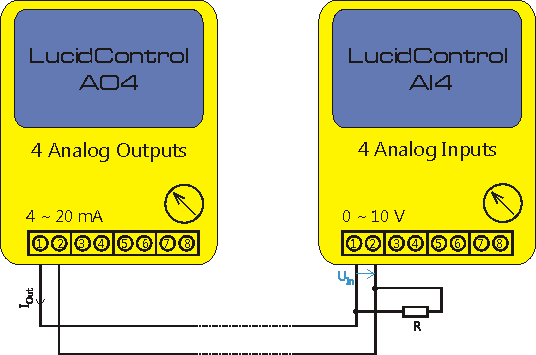 The solution is simple – using analog 4-20mA current loops. In order to avoid the disadvantages of voltage losses along the transmission line as they are existing using voltage driven transmission, 4-20mA current loops are the best solution. The LucidControl USB Analog Output Module offers an option driving a programmable current of 4-20mA (or 0-20mA) and they are ideally suited for building a reliable 4-20mA current loop. In addition to the Analog Output Module the current loop consists of a Analog Input Module and a resistor, converting the current into a voltage. 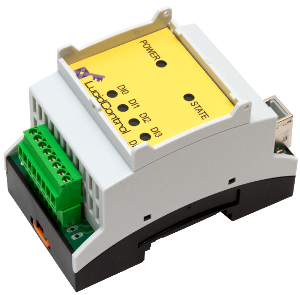 The USB Analog Output Module injects a programmable current IOut to the transmission line which is constant over the whole length. A voltage drop as it can be observed using the analog 0-10V interface exists here too, but it does not have any impact. At the receiver side, the current IOut flows through a burden resistor which has a specified value of e.g. 500 Ohm and converts the current to a proportional voltage UIn. A current IOut of 20mA for example causes a voltage UIn of 10V at the input of the 4-20mA Analog Input Module without errors caused by the transmission line. Which Option should I select now? To answer this questions you have to identify your requirements. In the case that the distance between the USB Analog Output Module and the USB Analog Input Module is small (e.g. less then 10m) the 0-10V option is the best choice. 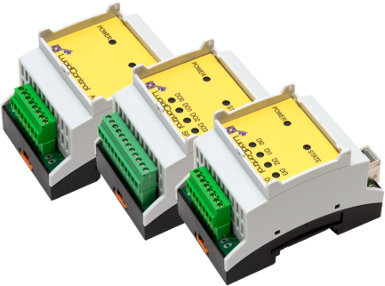 For distances above and especially when the transmission line is in noisy environment the USB Analog Output Module with 4-20mA current loop option should be selected because a constant flowing current is more robust against disturbances than a voltage measured with a high impedance. On the other hand, the constant current of analog 4-20mA current loop causes a higher power dissipation which must be considered when the modules are powered by small embedded computers like the Raspberry Pi which can only source limited current to a USB IO Module. If you are undecided whether the analog 0-10V interface or the analog 4-20mA current loop option is the right selection, do not hesitate to contact us and forward us your requirements. Based on our experiences will will help you to select the best LucidControl USB IO Modules for your application.